Since I started blogging at Parenting by the Book for Richmond Family Magazine, I have read twenty-four titles from experts on everything from our kids’ disconnect with nature to the importance of putting your marriage first. While trying to stay current on the latest and greatest, I’ve run into some conflicting ideas on childrearing. One example, Michele Borba’s belief that parents were sabotaging their children’s relationships with their siblings in Nobody Likes Me, Everybody Hates Me, particularly intrigued me. Sure I want my daughters to be close. The possibility that my husband and I might be contributing to their rivalry made me wonder how, or if, we could help them build a better relationship. Since I lack that crystal ball to foresee whether implementing any of the strategies from all of this reading will pay off, I turned to a parenting veteran to weigh in on some of the expert advice. Peggy Keogh lives in Midlothian with her husband in the house where they raised six kids. This career homemaker, mom, and grandmother says her adult children act more like best friends than siblings – and for the most part, they always have. 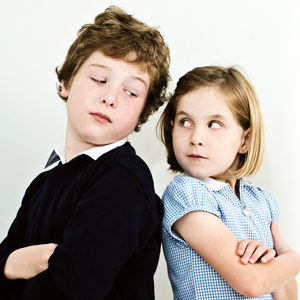 Do we set up our kids for contentious sibling rivalry? In Nobody Likes Me, author Borba argues that there’s no point in trying to make things equal between your children – it’s impossible. But she does believe there are things you can do to minimize jealousy, conflict, and bickering so your kids will grow to appreciate one another. You need to start by acknowledging the role you play in their battles, resentment, and animosity. For example, do you expect more of your oldest child? Do you pamper your youngest? Do you distribute chores, rewards, and opportunities fairly? She believes it doesn’t matter how many parenting magazines or blogs you read; without honest reflection, you might be condemning your family to a life of arguments, tears, and hurt feelings. “Write a list of what you like most and what you like least about each child. If your list is more slanted to one side or the other, it may signal you have a potential problem,” Borba writes. Should parents serve as mediators? In their best-selling book, Siblings Without Rivalry, Adele Faber and Elaine Mazlish maintain that you need to let your kids work it out by themselves. Otherwise, they will always involve you in solving disputes. According to this pair of experts, you need to ignore the normal squabbling, think about your happy place, and tell yourself the children are having an important experience in conflict resolution. That’s not to say there isn’t a helpful way to intervene if a situation is heating up. You just want to be sure you’re not undermining their ability to solve problems on their own. Faber and Mazlish suggest the following: Start by acknowledging the children’s anger towards each other. Listen to each child’s side with respect. Show appreciation for the difficulty of the problem. Express faith in their ability to work out a mutually agreeable solution. Leave the room. Success, according to expert Borba, lies in them agreeing to a fair solution without a parent. While Peggy believes it’s a good idea to let children work it out, she claims fighting was rarely an issue in her house, but she doesn’t think it’s because she followed the experts’ advice and acknowledged the kids’ frustrations. Logistics had much more to do with it. “They shared bedrooms so they were close. They had to learn to solve things. And at bedtime, they often confided in each other,” says Peggy. “There wasn’t this sanctuary sentiment that so many kids have now with their own rooms.” Immediately, I thought about how when the tension mounts I typically banish my kids to their rooms, telling them not to come out until they can get along. Perhaps I need to rethink this time-out strategy. At the same time, when kids fight, Faber and Mazlish believe it’s important to validate the victim. I remember hearing my younger daughter scream, “She said I’m not smart!” Big sister denied it. As it turned out, she’d told her younger sib that her cleaning method wasn’t the fastest. “See!” my younger one persisted. Instead of responding with my usual tactics, I tried the Siblings Without Rivalry approach, “Are your feelings hurt because you were trying to help, and your sister only focused on what you were doing wrong?” She didn’t answer at first, but finally, she muttered, “Yeah. How did you know?” And just like that she stopped crying. While Peggy acknowledges that as the years pass, you tend to remember only the good, she maintains she didn’t intervene in every little squabble. “Family life is too busy to mediate in every misunderstanding,” Peggy says. Ultimately, she credits the harmony in their house to the number of playmates from which to choose. With families today typically smaller in size, parents need greater tolerance for discord. “I think when there are less children there are fewer distractions. The fighting is harder [for parents] to ignore,” says Peggy. Two years and an estimated 4,800 pages later, I’ll keep reading the parenting books so you don’t have to. After all, that’s what Parenting by the Book is all about. But now that this subject’s been retired to my bookshelf and my notes have been compared with someone who’s been there, I’m inclined to conclude that one of the biggest problems with modern parenting is the failure to recognize the difference between being informed and ignoring your instincts. For while some say siblings will rival no matter what the age, it seems like the surest way to sabotage your children’s relationships is to parent with your head, not your heart.